Shrimp cocktail can be a tasty starter to a dinner or a refreshing addition to a buffet. Shrimp cocktail was de rigueur in the sixties and no party was complete without it being present in some form or another. Since then, the shrimp cocktail's popularity has waxed and waned. The seemingly ubiquitous cocktail is making a comeback and for good reason. The shrimp are sweet and succulent and the cocktail sauce is flavorful, with just a hint of heat. Combined, these two tastes are unbeatable. Putting together a shrimp cocktail can be as easy or as complicated as you want it to be. The good news is that at its most complicated, shrimp cocktail isn't that complicated at all. I take the cocktail part of shrimp cocktail seriously. 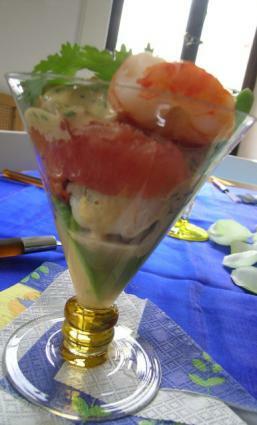 I think that using a nice large Martini glass to present the cocktail is amusing and a striking presentation, although the presentation can be as simple as arranging the shrimp on a small plate and placing a small cup of sauce in the center. I like to use rather largish shrimp for shrimp cocktail. If you get a pound and a half of U/10 or U/12 shrimp, you should have about 24 shrimp and that should be enough for six people. I like to use wild caught shrimp because the flavor is far superior to farmed shrimp. Call around to the fishmongers in your area or wherever you get your seafood and ask if they carry wild caught American shrimp. If they do, go get them. If they don't, use the shrimp you can get...they will work just fine. Adjust it to the heat level that you like. If it's not hot enough for you, add a few dashes of your favorite hot sauce. Dissolve the sugar and salt in the warm water. Let the shrimp marinate in the brine for a half hour. Preheat your broiler with a cookie sheet in the broiler. Take the shrimp out of the brine and rinse under cool water. Toss the shrimp in the olive oil and sprinkle it with the Cajun seasoning. Place the shrimp on the hot cookie sheet and broil for two minutes. Turn the shrimp over and broil for two more minutes. Place the shrimp on a cold cookie sheet or plate and refrigerate. This is a good stopping point. If you plan to serve the shrimp later that day or the next day, just cover them with plastic wrap once they are cold and you can hold them in your 'fridge for a day or two. To serve your shrimp cocktail, fill your martini glass 1/3 filled with cocktail sauce. Arrange the shrimp, about 6 per serving, around the edge of the glass. Serve cold. If your martini glass is rather large, you may want to put some shredded lettuce in the bottom and use a small ramekin in the center. Fill the ramekin with the cocktail sauce. Be wary of shrimp sold in jumbo, large, or some such designation as there is no official guidelines for these sizes designations. The "U" means "under" as in Under 10 per pound. The lower the number, the larger the shrimp.